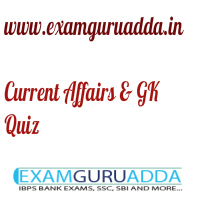 Dear Readers Examguruadda.in presents Current Affairs quiz of 19-20th December 2016 that cover important current affair events. Current Affairs quiz for IBPS PO,clerk, RRB-Po,Clerk, SBI, NIACL,Railways and SSC Exams. 1. The International Human Solidarity Day is observed on which date? 2. The 2016 Hero Indian Super League (ISL) has been won by which football team? 3. Who has been honoured with ‘Legends Award’ by the International Boxing Association (AIBA)? 4. Who become second Indian cricketer that scored triple century in test match? 5. The 2016 Sahitya Akademi award has been won by which author? 6. What is the current interest rate on Employees’ Provident Fund (EPF) for FY 17? 7. Which famous personality has become the brand ambassador of Assam tourism? 8. Saumitra Chaudhuri, who passed away recently, was the famous personality of which field? 9. What is India’s rank in the Global Wind Power Installed Capacity index? 10. Senate of which country has passed a resolution seeking withdrawal of its biggest currency notes?